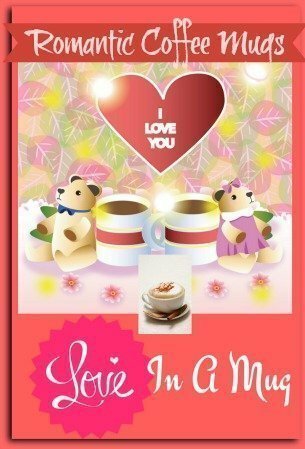 Romantic I love you coffee mugs make lovely Valentine’s day gifts for coffee lovers. These also make great birthday gifts for your loved ones. Start the morning with a sentimental I Love You coffee mug fill with an aromatic coffee brew. What a great way to bond with the one you love. A cup of coffee, tea, hot chocolate every day to remind her/him of you is so sweet. 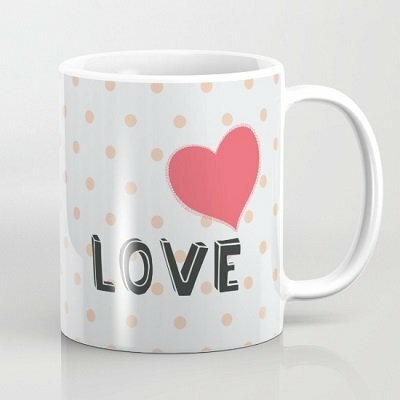 Coffee mug with message of love or Valentine coffee mug gift basket is a lovely gift idea for your java loving special one. Surprise her/him with a romantic mug and impress her/him with your undying love. What a lovely way to show your love – delicious cookies and a sentimental coffee mug made specially for Valentine’s day. The cookies are handmade to order and your recipient will receive them freshly baked. 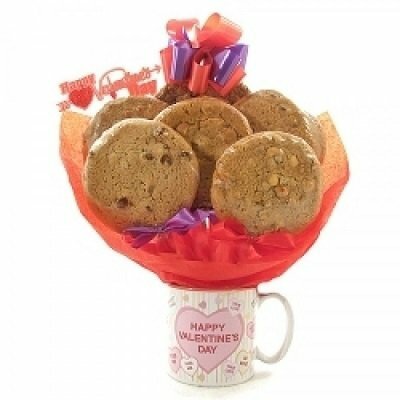 Cookies bouquet and happy Valentine coffee mug gift set is indeed a delicious and fun way to celebrate the season of love. You can get it in 11 oz or 15 oz capacity. This is such a lovely mug that will bring great joy to whoever you give it to. It has such a sweet and romantic feel about it with its red hearts and expressions of love. This cute ceramic coffee mug comes with wrap around image. It has a large handle for easy holding. It is available in 11 or 15 oz sizes. You can use it in the microwave. This doodle Valentine mug is also dishwasher safe. 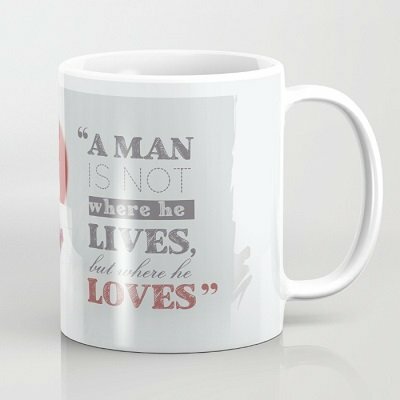 This ceramic coffee mug comes with the Latin proverb “A man is not where he lives, but where he loves”. 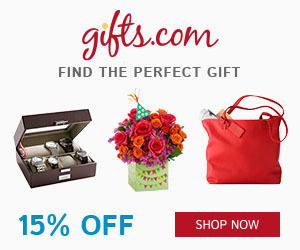 This would make a great Valentine gift to the man/woman in your life. 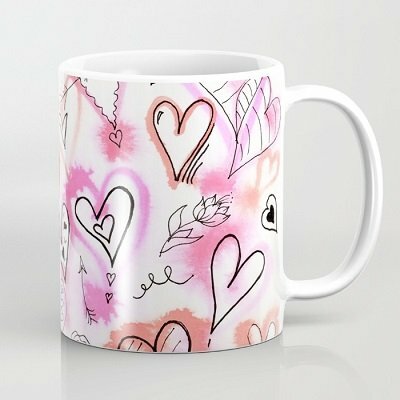 You can get this Valentine coffee mug in 11 or 15 oz sizes. This super cute toddlers hugging mug is all about hugs and kisses, love and joy – perfect as a Valentine’s day gift. You can also order it as a color changing mug (slightly more expensive). This cute ceramic mug is available in 11 oz and 15 oz. 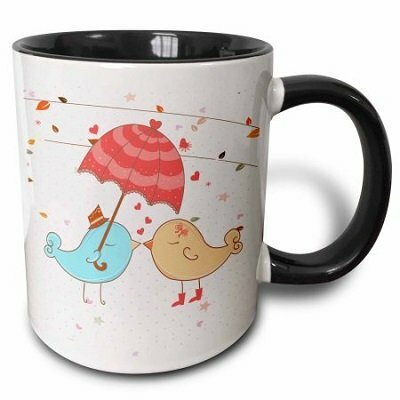 The cute kissing birds image is available on both sides of the mug. This 2 tone black coffee mug is lead free and microwave safe. This lead free, microwave safe ceramic mug is available in 11 and 15 oz sizes. This mug has a white interior and black exterior surface. 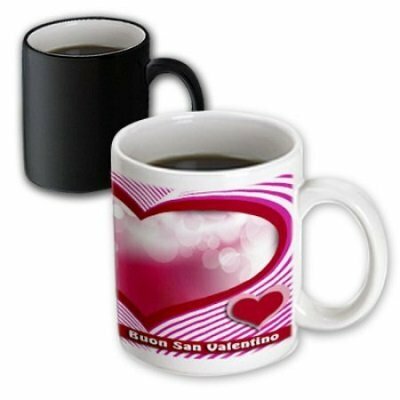 When hot coffee/ liquid is poured into the mug, the black exterior surface magically changes to white, slowly revealing the Valentine hearts image. Celebrate with your love with this beautiful red heart coffee mug. Whether 11 0z or 15 oz capacity, this little red heart love mug brings cheer as well as happiness into your heart and life. A lovely coffee mug for cat lovers, this is a large 20 oz mug that is great for soup and cereals too. This strong ceramic mug stands at a height of 4.5″ and has a diameter of 3.9″.